Goby Lake (GLK) is one of the shallower meromictic marine lakes in Palau. 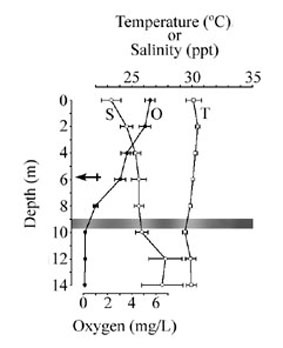 Only the northern basin (top right, in picture) is deep enough to shelter anoxic bottom waters from tidal and wind-generated mixing and therefore permit a dense population of purple-sulfur bacteria to grow at a chemocline (see figure, below). 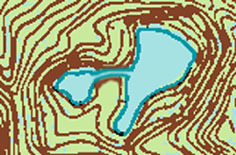 The embayment to the south and the basin to the west are oxygenated from the lake's surface to the flocculent sediments on the bottom, at 4-5 m depth. Goby Lake, like Big Jellyfish Lake and Ongeim'l Tketau, contains a population of golden jellyfish, Mastigias sp., with distinct behavioral, demographic, morphological, and physiological characteristics. The lake gets its name, however, from the abundant small fishes that inhabit the lake: the mangrove and puntang gobies (Acentrogobius janthinopterus and Exyrias puntang, respectively), and the goby-like eleotrid, Ophiocara porocephala.